They also said they will work together on visa facilitation, according to a press release issued after the meeting. It said China is looking forward to British Prime Minister David Cameron attending the G20 summit in China's Hangzhou this autumn, and will welcome him to visit China at a mutually convenient time to hold the bilateral annual prime ministerial meeting. high- level dialogue to map out partnerships in culture, finance and security, the release said. Britain's plan to upgrade its infrastructure, as well as their plans to revitalize manufacturing. Bank (AIIB), which will start operating in mid-January. According to the press release, China and Britain will increase exchanges in culture, education, sports and healthcare. At a joint press briefing after their talks, the two foreign ministers announced new steps to relax visa rules. The two countries will reciprocally issue multiple-entry visas for up to two years to each other's citizens and China hopes that Britain will increase the validity of visas to 10 years to Chinese citizens "at a proper time." The two sides also vowed to conduct closer communication within international organizations such as the United Nations. Wang said China appreciated Britain working to speed up negotiation on a China-EU investment agreement and to start feasibility research of a China-EU free trade area as early as possible. He also expressed hope that Britain could push the EU to fulfill its obligations concerning determining the price comparability of subsidies and dumping, which came in the terms of China's ascension to the World Trade Organization. 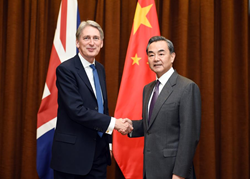 Hammond said Britain was excited to strengthen cooperation with China in infrastructure, nuclear power and finance, and he pledged that Britain will play an active role in the AIIB. He vowed to enhance cooperation with China in international affairs.